What do you pack when heading to the beach? Sunscreen. Surfboard. Bass Egg. Wait, what? Music is such an integral part of our lives now. If you’re not listening to music at your computer, you’re probably listening in your car or on your smartphone. More often than not, your smartphone is your everyday music player. But there are times when your smartphone speakers aren’t going to cut it. That’s when you need an external portable speaker. The Bass Egg isn’t exactly a speaker, but it does generate sound. I’d be you’re wondering what on earth I’m on about so let’s not waste any more time and just talk about the Bass Egg. If you like it, you’ll be happy to know that we’re giving one away at the end of this review. What is the Bass Egg? The $99.95 Bass Egg is basically a vibration speaker which on its own produces very little audible sound. Once coupled with any suitable surface like a wooden or glass table, the Bass Egg creates pleasant full-bodied music. It works by transferring vibrations to whatever surface it comes in contact with. What I found most interesting about the Bass Egg was the fact that the nature of the generated sound changed with the type of surface it came in contact with. For example, solid wood surfaces produced warmer sounds compared to glass surfaces. Once my interest was piqued, I went around placing the Bass Egg on every usable surface I could find, from tables to doors and walls. Interestingly, I found that hollow objects (plaster walls and doors) produced the most neutral sounds. To use the Bass Egg, you may either pair it with your smartphone via Bluetooth or use a 3.5 mm audio cable. Bluetooth is definitely a lot more convenient — it allows you the freedom to walk around with your phone and still play music through the Bass Egg. However, range is pretty limited. From my tests, the Bass Egg struggled to maintain a Bluetooth connection anytime the phone is more than 5 metres (15 ft) away. The 10-hour battery life it sports is decent, heavily depends on playback volume, and is rechargeable via USB. The Bass Egg isn’t the only vibration speaker available in the market today. Don’t worry, I didn’t know that either until I did some research for this article. ThinkGeek has one called the Vibroy Portable Vibration Speaker, for $39.99. And I’ll be the first to admit, if not for the word “speaker”, the Vibroy could easily be mistaken for an adult toy. The Mighty Dwarf Bluetooth Vibration Speaker comes really close to the Bass Egg, and at a very similar price point of $99.99. Although I haven’t the slightest clue how it sounds. The Bass Egg doesn’t produce music on its own — well, nothing appreciable anyway. Sound quality really depends on the surface it’s placed on, as it turns any object into a speaker. Glass produces tinny sound, whereas wooden surfaces generate warmer sound. Overall, the sound quality is average. It isn’t able to reproduce music as accurately as speakers, but as an audiophile, I’m pretty hard to please anyway. It’s meant to be. Although the Bass Egg is pretty compact, it weighs quite a bit (480g) but also feels very solid. It’s small enough to be placed in a backpack or in dashboard of a vehicle. However, because it’s cylindrical, it will roll around when stored; remember to keep it upright. Would I use the Bass Egg over a portable speaker like the Logitech UE Mobile Boombox? It depends. The Bass Egg requires a somewhat flat surface to work with, and that’s awfully difficult to come by when you’re having a picnic in a field, unless you bring your own. In situations where I’d rather not search for a surface to use the Bass Egg, I’d prefer a portable Bluetooth speaker — purely for convenience. Otherwise, the Bass Egg is an exciting gadget and an interesting conversation starter. Should you buy the Bass Egg? At $99.95, the Bass Egg isn’t exactly affordable, and you should roughly know what to expect before buying one. With an extra $30, you could get Logitech’s UE Mobile Boombox (which we will be reviewing soon) and not worry about having to find a suitable surface for the Bass Egg. However, the Bass Egg does have some attractive uses. For example, you could attach it to a wall and turn the entire wall into a large speaker. MakeUseOf recommends: Buy if you like specialty gadgets. How do I win the Bass Egg? The giveaway is over. Congratulations, Denise Blados! You would have received an email from jackson@makeuseof.com. Please respond before July 12 to claim your prize. Enquires beyond this date will not be entertained. This giveaway begins now and ends Friday, June 28th. The winner will be selected at random and informed via email. I could get a lot of use out of this! The bass egg. It's small. Would be easy to take with. It is portable and easy to carry around. Cool! as for me, no matter with one i used, it just matter of fact that it depent on my mood. i rarely used speaker loudly to hear music or similiar except when my mood is at the right choice to use either speaker or in this case i dont mind using this kind of speaker as long as i dony pay for it.. we call it "free item is always the best choice"
Looks like a keeper. But $99.00? I have heard some pretty good $50.00 speakers that are hard to beat. But I would rather a speaker, because surfaces are so difficult. At the beach? The little thingys lack BASS even though they name it "bass egg". I'm assuming this because of physics. I would prefer the Bass Egg over a regular speaker because I love technology that is very different and better than a regular speaker. Thanks for the giveaway…a regular speaker would be the ideal, but the bass egg would be great to take along on a vacation, or other away from home applications ! Usually a regular speaker as I don't want to be limited to needing a flat surface! I'm not really sure which one would prefer. I am so bored with looking for places to put speaker, they always take up so much room and I use them absolutely every day, so it would be impossible not to use them. Having one of these I would be able to listen to music with no more than my computer desk or the wall it leans against. Absolutely amazing and would definitely buy one. I would use it for working out. I would use the egg mostly. I'd use regular speakers qhen I'm at home, but not when I need to go on a trip or something, there I'd prefer the Bass Egg. I will use it if it's effective enough. I would rather use the bass egg because the sound quality would be awesome. I would have to say which ever sounds better. The portability of this puts it a total different category to a standard set of speakers, but I would rather this that just using my ordinary phone speaker. Love to have this speaker cause of it's awesome design. It's pretty sleek. 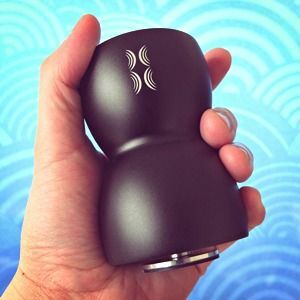 a regular bluetooth speaker works for me..but i am intrigued by the different ways the sound is heard while using the bass egg on different surfaces...while reading the article i was thinking of all the places/surfaces in my house where i could try it out on. I would rather use the Bass Egg than a regular speaker because you can produce better sound through a Bass Egg than a regular speaker. Would you rather use the Bass Egg or a regular speaker? Why? I love special gadgets like this. Always intend to surprise my friends and this just fits the bill. If I move around a lot (travel), then this might be a superb choice for the hotel rooms etc. cause, it's like, cool man. I'd love to try the bass egg in my office where there's lots of different surfaces to experiment with or hear what it sounds like sitting on a car bonnet. A standard speaker might be more practical but this looks like more fun. Preferably i would try to use bass egg instead of a regular speaker. I'd like the portability. I use headphones, but there are many times I need to play sound for others to hear and this would be great for that. I have a variant of the Vibroy. It works pretty well, but the Bass egg looks like it can pump out a lot more sound/vibration. For a portable speaker I'd always want to use the Bass egg. Creativity and variance in sound on things found anywhere is almost as entertaining as the great sound they produce! I'd want to try out the Bass Egg...it's a fun gadget to have! I would use the bass egg. Bass egg, of course. Just look at the size and the booming sound it provides. I like the Bass Egg as it requires less space. I have something similar that I take on trips and the space saving is important. Sounds like this might not be useful in all situations, so a regular speaker (like the logitech also being given away!) is probably more versatile. It appeals to me, another gadget to play with. Far better than the widget. I would bring this for a fun day of bbq and relaxing on the lake! I'd like to use the Bass Egg because I need something small & portable. I'm always on the go. And outside a lot (beach, other activities). This looks perfect for my lifestyle. Always Base Egg. Why use regular speaker when you get a better sound experience with portability. I think a nice pair of regular speakers would be better but for travel situations this could be cool. probably a regular speaker but would love to try this! Rather the regular speaker, my flat surfaces are usually cluttered. Bass Egg because i need a portable speaker at work. I'd prefer the bass egg because it is different and creative. Bass Egg, because it is ideal for portable devices! The bass egg because it is so portable and great to travel with. The Bass Egg because it would be so much more convenient! I would prefer the bass egg if it truly sounds good on any surface. Having a larger surface area will make the sound more vibrant and louder. Would try the bass egg. Won't hurt. I have used several regular speakers nd would definitely try this one.. it is awesome.. I would prefer a regular speaker but would love to win this Egg Bass and give it a try. I'd prefer something small like the Bass Egg so I could take it more places. As stated in the review, they both have their pros and cons, but it would be nice to experiment! regular, just because I'm familiar with it. But I would use these every day if i won! speakers are a dime a dozen with nothing new. Until the Egg!!! I would rather use the egg due to the fact that it seems to be a new technology. Speakers are cubbersome. I'd maybe use this over a regular speaker at home - I'd hook it to the wall and turn the room into a party! I would rather use a Bass Egg, because I can listen in the bathroom while I'm getting ready for work. This is the sort of thing I'd try just out of curiosity. A regular speaker, but this is a good one to take on the go! I would prefer a regular speaker, but this would be such a useful alternative when one of those is not available. I can see that I would get a lot of use out of this. I really like the cute design. Although a regular speaker, I'm sure, would trump the Bass Egg for sound quality and audible capability, the Bass Egg and other vibration-type speakers of the sort are quite a novelty. Add bluetooth capability and you've got yourself quite the toy. In most cases, I think a regular speaker would get my vote. But, the Bass Egg would really impress when you can turn the whole wall into a speaker :P . Regular speakers get my vote on this one. Regular speakers because they are already installed. Speakers are more practical, but I like the cuteness of the egg, so I might buy it instead! A regular speaker seems easier to use, but the Bass Egg would be fun to play with. Traditional speakers are great but there is something to be said about a good portable speaker, I love them! I would use a bass egg. Space is definitely limited, and speakers take up a lot of it. A small, contained unit would be great. the egg..it sounds really fun. Because I don't have any portable speaker. Have to try it before deciding, the neighbours might complain a bit about having an entire wall serve as a boombox. 'Sounds' like a great invention- and a better giveaway! It looks cool but i dont think its worth it !! I'd use the Bass egg because it's portable. Absolutely BassEgg, it's so suitable size speaker that it goes anywhere i want it to be? A regular one because the egg shape is not ideal for me but for free I would not mind the shape. I like your review of the egg and I like what you have to say about it. I have regukar speakers and like them for the stereo but if I won it would be worth trying to see if we would want to switch over for smaller things like the computers. I would rather use the Bass Egg, it's portable, lightweight, compact and just so cool! Definitely! I love the minimalist look and would love to try the bass-tacular sound! The Bass Egg as it is something new I don't have. Unable to view the widget? Please disable browser privacy extensions and/or ad-blockers. I don't use any such extensions or addons yet there is no widget to fill in the required info. If this product works as well as the site says, I would prefer the Bass Egg to a regular speaker. The speakers in my laptop are awful! Bass egg because its smaller more compact!!! A regular speaker would be more practical, but this Bass Egg seems cool and different, I'd probably opt for it. I'd prefer a regular speaker because I am doubtful that the sound quality of the egg is just as good. I'd have to see it to believe it. I would still like to have an external speaker available, but if indoors and with friends or something I would definitely pull this out and give it a go. The become a fan isn't working. I became a fan, but it didn't register my entry. I am unusual so the bass egg would fit me! The Bass Egg because it's more compact and a lot cooler looking. Id use the bass egg, Im all about portability. I'm not sure which one I would prefer until I've tried the Bass Egg. honestly, that price would need to come down to consider a purchase because there are so many other options in that price range that would offer decent sound. but if that priced dropped in half it could be considered. Bass egg. It's cute, stylish, portable. Yes, yes I would! I'd use it at work for playing music! I'd also use it for my workouts - I workout everywhere so this would be amazing: in the backyard, at the gym (I used to be the DJ at my old gym, cause the guys loved my pumped up music :)) ).. The Bass Egg for sure. i would love to dance to this on the beach as we go every weekend! Not sure, be fun to try! I would rather this for the awesome sound it gives out! Thanks. I don't think I care either way as long as it plays clearly and loud enough. I personally like the idea of a Bass Egg. Remember the bone phone an ancient audio device that transmit sound through the bones in your body. This Bass Egg is an interesting device. I am not sure I would have to try the Bass Egg and then decide! A regular speaker because I've never tried Bass Egg before. Send me one so I can try it to see if I like it (see what I did there). I think I should really try this new breed of egg for the sake of its portability!! I wanna try the bass egg. think it'd be cool ? I Of course I would like a regular speaker but this sounds great also. I would use it regularly, because it could be a nice alternative for mobile purposes! I would definitely use the bass egg vs a normal speaker. I am constantly on the move and working from multiple places. It makes sense to use something that is portable and gives a good bang for my buck! I'm choosing the Bass Egg because it is small enough to take in the backyard. I can't carry my huge speaker outside. I would rather use a Bass Egg instead of a regular speaker because it is easier to tote around, plus the bluetooth connection. The Bass Egg so I can get away from my awful moaning spiteful vindictive neighbours and listen! Would be cool to test it, but I think I still would prefer a regular speaker. Yes Bass egg amazing to watch!!! I have a regular speaker so I am very interested in the Bass Egg. I like the Bass Egg speaker for use it with a tablet. The Bass Egg looks to be an interesting concept. Based on your review I may buy one however if I were to win one instead I promise to spend the money on beer or RAM. use it. anything is better than oem mono. This looks fun to try for certain! I use a regular speaker, I diden't heard about the Bass Egg till now. I would go for the Bass Egg. Why because you can set it on almost any surface and depanding on that surface a song can sound different everytime ultimate toy for any entertaiment or sound tech. I also have a lot of regular speakers. I would use Bass Egg because it is just very cool to have a new kind of speaker to show off. Would you rather use the Bass Egg or a regular speaker? Why? I will use the Bass Egg if I win the giveaway because this is awesome. Bass Egg, i like it! I don't own a radio anymore...I listen to everything on my cell or laptop, so I would go with the Bass Egg. I would say that it not only does it look nice and sleek, but it would probably serve my needs. Well, I use Bass Egg at the place like beech etc. Its better to use a regular speaker. I would get wireless speakers/dock instead if I was just going to put it somewhere on a table or desk and leave it. This is more for portability if I wanted to use it in odd places or even to play jokes and pranks on unexpected people. I prefer bass egg. it's more efficient and practical, and really interesting design :) not waste space .. I will not buy this for that price, I'll buy me instead a good pair of earphone but for free, yes, please! Bass egg for a change! The portability and small size makes the egg a viable option in certain circumstances. I assume one sacrifices sound quality, but I'd love to have it as an alternative. I'd rather use a Bass Egg for the simple reason that I don't own any conventional speakers! Then again, even if I did I'd prefer to use something free than something that cost me money - I can't help it, I'm a mercenary old bugger! Bass egg. bass is better right? Generally I would use a speaker, but more times than not, I would LOVE to use the Bass Egg! Fantastic for on the go! Of course I use the bass egg because I more comfortable to hear the songs without wires. I think I would prefer a regular speaker, that would work with both bluetooth and a wire, because not all units got bluetooth, and then just BT wouldn't work, but I definitely wouldn't turn this down if I won! I would love this. I need something small for the home office that can be taken with me when I decide to work elsewhere.This would be perfect.. Probably a regular speaker. I'd still like to win the Bass Egg though. I will definitely put this egg to work. What is nice about this, is that it is portable and compact. I would probably prefer a standard speaker, but if I win the egg I'll surely use it! Regular speaker instead of Bass Egg because of its price! I would use this one at home or work as long as I had a nice surface to put it on. However, for on the go use, a regular set of speakers would be my choice. The Bass Egg because it is new and I have never tried a portable speaker. Bass Egg. It is free. Q: Would you rather use the Bass Egg or a regular speaker? Why? A: i would rather prefer a regular speakers but i like its portability. I would be really interested in using the Bass Speaker over a regular speaker. I like the size of the bass egg - and its a "gadget", which makes it more desirable. I Would prefer a regular speaker, though I would love to try the Bass Egg. Frankly, I can't afford any kind of speaker. I would love to be able to use my iPod with a speaker. I'd probably use a regular speaker, but this is a pretty cool gizmo. I like the fact of its sound being able to adapt to different surfaces.I listen to many different genre's of music and being able to choose the way in which the sound is replicated and delivered is intriguing and opens many possibilities in the different ways I will listen to the music.. I have heard the sound is very good on these. If they are that good might have to use it, takes up much less space. Honestly, earphones are my first choice. And if not, I'd go for regular speakers. But I'm not going to say no to this if I won. The Bass Egg, Because it's going to show up in my mail box. Regular is fine by me but if I won it, who would turn it down, right. I guess it would depend on where I'd need a speaker. But I do like gadgets that like a different/unusual approach and this one seems to be just that. I would probably go with the regular speaker - But what fun I could have trying it on different surfaces. I could make a video, put it on YouTube, I might become famous, I could ..........Oh never mind. I think the bass egg would be a good wireless solution plus i love a good deep bass sounding speaker. I would like to try it out, but I really do like unique items. This would fit in with my gadgets well. Bass Egg, because of compact size. It'll be a great conversation starter because I'm usually at a loss as to how to start a conversation with a stranger. Normal speaker most of the time, better sound quality. Out and about this has advantages though. for the price of this egg I would not buy it .....but I would love to have it for free! ..In my country of residence,regular speakers are not allowed inside the cemeteries,I see salvation with Bass Egg..
Yea, I always get hassled when trying to walk through the cemetery with my boom box blasting NWA. speaker with a big bass! I'll go for the bass egg. Because of it's bluetooth connectivity. Since I won't be staying at home from the next month (and probably be travelling frequently), I'd go for a portable speaker if I really need one ( I prefer earphones otherwise). The surface based music intrigues me and hence I'd say I'll go for the egg. "What I found most interesting about the Bass Egg was the fact that the nature of the generated sound changed with the type of surface it came in contact with." Not at all, I welcome it. Well, not all audiophiles understand the physics of sound. And not all physicists are audiophiles. So, I thought it'd be safer to clarify. Anyways, good luck! A normal speaker but I'd like to try this to see what all this about? the video was not enough. Damson also do a very nice looking vibration speaker around the same price. I believe that these speakers are quite heavy and well built, It really depends where you are going to use the speaker, for portability well the Bass Egg (strange name) would be great but if you only listen to your music in one room then for $99 there are some really great sounding speakers our there. Simple, portable, cool & funky! Regular speaker, I would certainly appreciate the novelty of the egg. I would have to compare the sound. This is nice for the laptop though. I would use Bass egg speaker if had that much money to spend on speakers cause no speakers alow for good bass. The bluetooth connection would save from being tethered to the phone, so in some circumstances the egg would be preferable. I would love to try the Bass Egg til then I don't know. I would not pay so much for the Bass Egg, but if I won it, I would definitely use it...very portable. Obviously a regular speaker. But in a pinch, I could boil and eat this, right? Tried it. The metal was still too hard to bite through. A regular speaker would be my preference although it would be hard to turn this one down if I won!